Idaho Preppers Network turns one! Thanks to everyone who has contributed and/or commented and/or read Idaho Preppers Network this year --hard to believe it has been a year today. I hope the next year goes as well, and that we all get as prepared as possible! I've certainly learned a lot, and hope to keep learning more and more....thanks again! --I was debating on a purchase in a store that shall remain unnamed, but the price was somewhat steeper than I was wanting to pay. I kept coming back to look at the item that I was considering, and one of the store clerks said to the effect, "I'll let you know something--that will be 50% off tomorrow." I asked if it was just the following day (knowing I wouldn't be back the next day) and was told that it would be discounted for at least a week. There were not many of the item on the shelves, and the clerk even offered to put my name on it and put it under the counter. I declined, but said I would be back. I was grateful to the clerk for sharing that information. I was back two days later, and the item was nowhere to be seen on the shelf I had visited previously. I need to mention that the store in question is not one that I would ordinarily frequent because (at least in my perception) the prices there tend to be higher. But because I had come back another day, and had not purchased the original item immediately, I had more time to look around. I came across something that was a perfect purchase at a reasonable price for someone else on my list, and was going up to purchase it, when I asked the clerk who was there (not the same one) if the fact that I couldn't find it on the shelf meant that they didn't have it. The clerk checked on the computer, and directed me to the promotional table, where, yes indeed, the original item was there, discounted price and all. --I've been using coupons more, and there are times that I will go out of my way because the coupons enclosed in the newspaper make it worth my while to visit a particular shopping establishment. I can sometimes get sticker shock visiting the dairy section of just about any grocery store, especially when it comes to cheese prices. So recently, when there was a good coupon price on bricks of cheese, I made my way to the store in question so that I could take advantage of it. The preceding examples of kindness were personal experiences, but there are evidently many more experiences happening across our state where people are being kind to each other, if you look at this article from the Idaho Statesman. Despite the rough economy, many people in Idaho have made huge efforts to help those less fortunate. Wishing everyone a wonderful day--Merry Christmas! Sorry it's been so long--computer issues and general busy-ness and whatnot have made for far and in-between posts. Thanks for coming back to read! 2. Angel biscuits, the recipe for which is found in this post on my other blog. 3. This recipe for fry bread. This recipe was mentioned in the post already mentioned on my other blog as well. 4. This roll recipe, which was my first successful foray into the world of yeast. Takes eggs and butter, so not as basic, but there are sales on butter around just now. Just put some butter in my freezer after I was able to get it at a good price. 5. Buttermilk biscuit recipe, found here, at Safely Gathered In. I just add 1 tbsp vinegar or lemon juice to one cup of milk to get the buttermilk, so pretty food storage friendly. Hope these help someone, and hope that everyone is enjoying the Christmas season! The recipes linked are easy--it's what I look for, so wishing you all the best if you try them! I figured I would just have to ask when they were going to stock up again, but managed to get a couple of cans of chicken noodle soup (Chunky) because they were on display in the front of the store by the checkout. Then this morning, having forgotten something needed for this afternoon, I found myself in the vicinity of a different checkout line, and found 4 packs of Campbell's chicken noodle soup, at 2 packs/$4. I got several, because if I find that I can get soup for $.50/can I try to take advantage of it. In other food advertising news, thought I'd mention that at Albertson's this week they have Rice-A-Roni for 10/$10. I mention this one because of the Spam Fried Rice recipe over at Preparedness Pro that makes an oh-so-handy meal in terms of a 3 month supply option. I've already mentioned it on my other blog, but if you're looking for another easy meal for your rotation, you might want to check this one out. Let's hope that everyone is preparing enough so that they'll always be able to say soup's on when we'd like to---emergency or not. Found this article on Idaho government a little while ago--it shows how dependent the financial system of the state is on personal income tax. People who have no jobs don't pay income tax, and the state, in turn, receives less money. Programs still have to be paid for, or cut. So for everyone that loses their job, everyone feels the effect somehow. If we end up paying more-- for example, for school activities or the like--then that money has to come from somewhere. The more supplies we already have on hand in terms of food and/or other supplies could help by allowing us to put the money at our disposal towards these new expenses while eating our food storage, instead of our having to choose between the two. That's just one example, and while I am certain other people could give better explanations/examples, I do know that anything we put aside today in terms of emergency preparedness supplies will help us later. Those fortunate enough to remain employed may be able to put available cash towards other expenses and even be able to help out others, while those who find themselves unemployed will be in a much better to position to feed themselves and/or their loved ones. We're all in this together--please do what you can to increase your emergency preparedness supplies. One can at a time, one bottle of water at a time, one piece of knowledge at a time, it all matters. The key is to start. Or to keep going. And above all, to never give up. If you are in a hard situation right now, I hope your circumstances improve quickly. What affects one of us truly does affect us all. Prepping is kind of like eating an elephant. How do you eat an elephant? 1 bite at a time. Everything needs a start point. I am not sure what drives you. Now maybe it’s I want to prep for whatever comes. Or it might be I’m not sure what I can afford power or food this winter. It maybe you live in Earthquake, tornado, hurricane, flood country. FEMA has been less than stellar in response. Winter is coming up, are you ready? Trust me guys all you have to depend on is yourselves, friends, family and neighbors. FEMA and DHS have stated they will not be around to help, anywhere for 3 days to 2 weeks. Go to the FEMA or DHS websites, and check out what they are saying about their own “emergency response”. So if you are depending on the US Government to help you. You will get mighty thirsty and hungry. 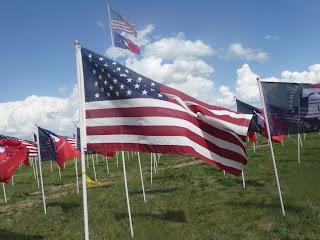 Go to the Google or ask how much help folks got in the Dakotas during flooding, or during the ice storm that cut across mid-Appalachia last winter. Power was not out for a day, but for weeks. Do you have water/food for 2 weeks? Trust me all stores will run out of everything in 3 days. Now this is about preparing. Take care of yourself 1st then you can help others. You can’t get into a “Bunker Mentality” you have to be ready to help and be help by folks. Get to know them before any emergency. You will save on your food budget. You will have peace of mind. You are ready. Get ready boys and girls it will be a bumpy ride. But it can be fun as well. 1. I love nothing better than sending back those credit card offers I get in the mail and stuffing as much paper and weight as I can back in their pre-paid envelopes. Funny I don’t seem to receive very many offers from them anymore. 2. Do you know what is going on in the world? Its global economy, what happens in Russia or China or Saudi Arabia, Australia, Brazil or the US or any country will have an effect on the whole world. This isn’t about politics, it’s about the power of information. 3. Prioritize: Remember the rule of 3’s. 3 minutes without air, 3 days without water and 3 weeks without food. I believe Food is a great investment. You will need it no matter what. Once you have your basics covered you may want to look at other options. HINT: Do you have meat that is freezer burned? Use a pressure cooker to cook it, will re-hydrate the meat and you won’t waste it. From Marie: Thanks, J.S., for another great post! Went to the Malad Welsh Festival on Saturday. It was a lot of fun. There was a "Taste of Wales" booth,Welsh singing, other performances, and games for the kids to play. 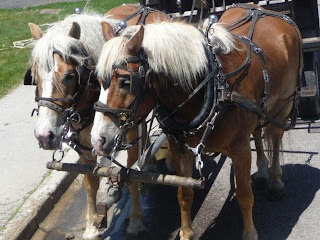 One of the highlights was a horse-drawn wagon tour around Malad. The picture above was taken of the wagon behind ours--it was nice that the weather was great there on Saturday. About now you may be thinking (if you are still reading) that this is just a fun activity post, but oh, even on this trip I found something that applies to prepping...and it has to do with how Malad got its name. --When some Frenchmen arrived in Malad, they got terribly ill after drinking the water. Malad is short for maladie, which means sickness in French. --When some Frenchmen arrived in Malad, they ate the tails of some beavers that had apparently not had that great of a diet. Beaver tail was considered a delicacy at that point--and you guessed it, they got sick. So they named the town Maladie, which eventually became Malad City. --The Welsh Festival in Malad is great. --Was reminded that clean water in all circumstances, including emergency preparation, is a necessity. Make sure you have good water to drink, or you may be marked forever. Malad's been called Malad for a long, long, time. Thank you, Congressman Minnick! Thank you, Congressman Simpson! Just called Congressman Minnick's office (again) and was informed by his staff that he is voting against the Cap and Trade Bill. Just called Congressman Simpson's office (again) and was informed by his staff that he is voting against the Cap and Trade Bill. That's Idaho. Thanks to all who called and e-mailed. And thank you, thank you, thank you, to Congressman Simpson and Congressman Minnick for voting against the cap and trade bill. Speak out on "Cap and Trade"
You might be asking yourself why I would want to make a post about the cap and trade bill coming up for a vote tomorrow in the House of Representatives, or link to an article like this one. What does that have to do with prepping? --has the potential to really, really, really negatively affect our energy bills. --could cause food prices to go the wrong way---up, up, up. I don't want to have to resort to using what could be considered emergency supplies before I have to in either the energy or food arenas. These problems are only two of the problems I see with this bill, but aren't they reason enough? If you are not in Idaho, you can find your Representative's contact information here. You will need your zipcode to access information. The bill is H.R. 2454, but asking them to vote against the cap and trade bill will help everyone. Food and energy prices are at sticker shock levels for many already. The good news is that the previously linked article also indicates that the result of the vote is not set in stone. I just got off the phone with Congressman Minnick's office. His staff indicated that he has not yet made a decision on this legislation. This may be true with other Representatives as well. Your voice can make a difference. Note from Marie: This is late only because I don't check the e-mail account connected to this site often enough. I first saw this today, and my gratitude goes out to IdahoBob for graciously allowing me to post this wonderful tribute to his father. As I told him, I think it is a message that resonates all year round. Today is Fathers Day, and it is the first time that I have not been able to talk to my father on this day. You see, he passed last July. I was out of town for a month, working on a job in another state, and my wife called me one morning, on my boss's cell phone, to give me the news. It was not un-expected, 'cause he had recently had quadruple bypass surgery, and had developed pneumonia. He was a very sick man for next four months. When we found out that he had developed pneumonia, we made the decision to travel to where he was hospitalized, (in that horrible Socialist State of Kalifornication) and spent two weeks with him. No hesitation or argument with each other, we packed and went. Ya have to understand, my father was my hero. He was the most important man in my life. I loved him, deeply. And I told him so, often. So today, especially, I miss him. there is a great big empty hole in my heart. On this day, Fathers Day, hug your fathers hard, kiss 'em, tell 'em that you love 'em, and that they are the most important man in your life. OK now I have done it in true DX fashion for all you HAM'S out there.I know others that read this will be real confused now but I would really like to hear from you HAM'S out there so I figured I would write in a language you would understand. We need to get HAM'S involved here so we can try to get a net going to help with off the grid communication among the prepper networks. I know there are many Ham's already involved in the prepper network and many more that read so please come forward and help us with getting this going. Now that all the people that read this (that are not HAM'S) are confused let me add one more slang that only the HAM'S will understand. Please email me so we can get to work on this. To everyone that has showed an interest in the HAM radio netJust to let everyone know Bob KI4HEE from South Carolina and myself Dave W4DMH held a test run Thursday night on 40 meters at 9:00 PM Eastern Time or 0100 UTC time. I am sorry that I did not get this info out but this all came about by email at the spur of the moment. It was a success even though I do not have the proper antenna in the air for 40 meter. I will cure that this weekend however. Bob will be posting the results on the South Carolina Page on Saturday June 20 2009. I invite you all to read that to see how the impromptu net turned out. For a spur of the moment thing, I think it was great. This little test run proved to me that if we try we can make this work. I will let you know when this all gets worked out for sure but for now I believe we will try this on Thursday Nights from 9 pm to 10 pm Eastern time or 0100 to 0200 UTC on the frequency of 7.245 or there about for any that wish to come join in or just to listen. Thank you all for your interest in the American Preppers Network Ham Radio Net. Hope to hear you soon. A lot late posting on this, but there is one day left for Meridian Dairy Days. If you live in or are going to be in the Meridian area tomorrow, you may want to check out the last of the Meridian Dairy Days, which apparently have been going on since Tuesday. You can find out about the details here. "People say what if it ends tomorrow? For me it doesn't matter. For me it ends today." I have to say that I admire everyone who stuck with this experience, and the woman who left (I think there were only like two or three days left in the experience at this point) was an extremely valuable member of the team. She knew how to do things cooking with what they were able to hunt down and eat that I thought were amazing. She stuck it out for about four weeks if memory serves, and then she decided she was done. She didn't know it was almost over. But it was. --They hadn't eaten anything substantial for three days when they got their final map, which, by the way, indicated that they had something like 14 miles to hike before they reached their next shelter. For some reason, it seems to me that one of the things they were worried about was the fact that they would have to make a temporary shelter at a high altitude on this particular trek, and hadn't been that successful in that kind of endeavor in the past. They found this out the night before the actual trip, giving them plenty of time to decide to just go home. --They finally saw some cabins, but there was no one there. If they hadn't been paying attention, they may have missed the fact that railroad tracks were close by. When they saw the tracks, they had another dilemma: would the train come by once a week? Would the train come by once a month? They looked at the tracks and found that they were clean, indicating that a train had come through since the last snowfall. 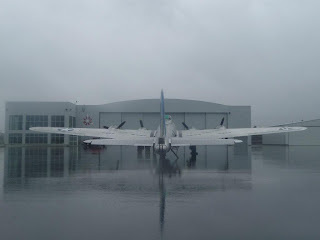 Since this is Alaska we're talking about, it was snowing regularly by this point. I think about that moment a lot--if trains only come by once a week or once a month, would I have stayed with the experience at that point? Or would I have figured that since the tracks were clean, that I had already missed the train, and there wouldn't be another train for at least days, and maybe weeks? I like to think that even if I thought that temporarily, that I would have then decided to perhaps follow the tracks... So there was another point that they could have said they were done, but they didn't. They made a makeshift flag out of a white shirt (which indicated distress) and waited for a train. "I was never going to quit. That button (that would have immediately summoned a helicopter to take him back to civilization) on my belt may as well have been nothing more than a piece of jewelry." The other people who made it also gave their reasons, and though I don't remember their words exactly, they all stuck with it, even though it was an incredibly difficult ordeal. It seems that one of them said that there were times when she was so cold she just wanted to go home. And another said something like he was never going to quit as well. I guess what it comes down to for me in terms of attitude was that they made a decision not to quit, and they stuck with it. This didn't mean that they didn't want to go home. It didn't mean that they wouldn't rather have had nice things, and at the very least would have preferred having the basic comfort of being able to get warm. It meant that they wanted to go home the way that they chose, and they did have the choice. It did matter, to the ones who made it through to the end, that the whole experience "could end tomorrow." They had hope, even though at times they had very little else. It looked very, very bleak before it got better. But it did get better. They won. And the only competition they had was the competition within themselves. Continuing to go forward is a triumph, even when progress seems slow. You never know what will happen tomorrow, and tomorrow does matter, whether for preparation, or in the midst of emergencies. In the case of the people in the program, attitude appears to have been a major factor. It is a major factor for us as well. My proverbial hat is off to all of the people who participated in that experience. ---Idaho's having a free fishing day this Saturday--June 13. Find the details here. ---There's a request for public comment on fishing rules until June 26th. Find the details here. 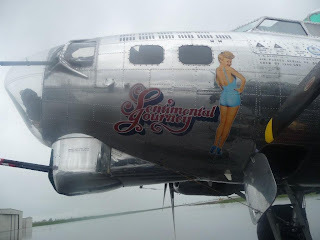 There was also a gentleman there that was a tailgunner on a B-17. Amazing. We took our children through and talked about history and hopefully they will remember the men who fought in WWII, both those who did and those who did not come back. What does this have to do with being prepared? Well, we each need to do our part and if we are prepared for emergencies of whatever nature, we will be stronger individually and stronger as a nation. We can learn from the resourcefulness and courage of those who have gone before us so that we too can meet whatever is coming our way. WWII was a tough time--victory gardens, rations, and in the end, success. To those who have served and returned: Thank you for putting your lives on the line to protect our freedom and to serve our country. To those who have had family members serve and not return: I am grateful and I will never forget. "I have just received inside information from two chains that formal letters are being disseminated among grocery stores across the U.S. informing employees that wheat and affected prices will be doubling by the end of the summer. Food prices in general have experienced the highest inflation rate of the past 18 years. " "Not such good news" is not strong enough. Bad, bad, unfortunate news is closer. There is also this post, over at North Dakota Preppers Network posted a while ago. More recent articles on the wheat situation can be found here and here. If you don't have wheat, or enough wheat, in storage, please consider increasing your supply if you have the means. In Idaho, the news may be a little better, according to this article, but it's always good to hope for the best and prepare for the worst. Do you have a garden in your front yard? Have you heard about the Fisherman's Breakfast? "Breakfast visitors also will get to hear a presentation by the Idaho Fish and Game about prospects for fishing as Idaho's general fishing season starts Saturday. And Smokey Bear will be at the event to shake hands with kids and promote fire safety." If you go, I hope you enjoy--it's a long-standing tradition. "If purchasing seeds, consider only those plants that can mature in our local zone (high altitude and ~90 day growing season). Purchase enough organically grown, open-pollinated garden seeds for 2 years of planting in the event the 1st planting is ruined by frost/hail, or seeds become scarce or unavailable the following year." Basically, I see this as preparing for an emergency that could happen during an emergency. And situations unfortunately do occur where emergencies don't happen one at a time and few and far between. For example, there is what is going on in Uganda, which you can read about in this article. If I have my facts straight, in 2007 the regions written about had damage by floods. The floods were followed by drought. There have been delays in planting. In 2008 disease hit an important crop. Available food has become more and more expensive. And there is more--low crop yield, stolen food--it's a dire situation. I recommend reading the article in its entirety, because it is sobering, thought-provoking, and may give you more ideas on how you should prepare. It's certainly given me some. Some may think such conditions would never happen here, wherever here may be when you are talking about a worldwide web. I think that it wouldn't matter where you were sitting, standing, working, or living if you didn't have food to eat. It's something that we all have in common--the need to eat-- and while our climates, viewpoints, material wealth, etc., may differ, we also all have the personal responsibility to do the best we can to prepare for difficult situations that may come. You/I/we all need to do what we can within our means to prepare, and sometimes there may be multiple emergencies that hit at once or one after the other--hopefully you/I/we will think as far ahead as we may need to in order to make it through such situations in the best way possible. If your answer is no, you might be interested in the article, "Urban farmers make the most of tiny Boise plots". In Boise, people who don't have land work other people's land-- in return, for the most part, for labor or part of the produce. It sounds like a good plan if it works well for all parties involved, although there are a couple of downsides also included in the article. I was interested to find this after a recent conversation I had with someone who is basically an expert in emergency preparedness. During that conversation, this person pointed out that the people who are "stuck" in the city with no way to garden will be in real trouble in the case of a food emergency because they don't have land to grow food. Perhaps if there were more programs like this around, there would be fewer problems if there were a disruption in transportation of food goods, less produce available from bigger farms, etc. The thing is, it doesn't seem like this is a "program" per se--one of the people mentioned actually put fliers around just to find the landowners when he was first starting and wanted to use the land for food production. These people are just going out and finding a way to have land they can use, and perhaps make a profit as well. And how much land do you have at your disposal, really? Some of the people in the article use a front yard as a garden. TV can be educational, or at the very least, it can make you think. Has anyone else been following the show "Out of the Wild" on the Discovery Channel? Nine people volunteered to go out into the Alaskan wilderness, with no idea as to how long they would be there, with directions to go from shelter to shelter to shelter until they make it "out of the wild." They have to endure the cold, hunt, endure the cold, manage the conditions while ill, endure the cold, get along with each other, endure the cold, go hungry, endure the cold....well, you get the idea. As of this writing, four people have used the GPS locator each one of them has been given, which when activated immediately results in a helicopter ride back to civilization. That leaves 5 who have already endured more than two weeks in harsh conditions, and who, at the end of the last episode, were setting off on yet another trek, not knowing that they had farther to go than they thought, seeing as how they had misread their map... There is no prize for anyone, unless you count the satisfaction of knowing that they can survive the experience, so it's not a matter of money or luxury items as motivation. The thing that saddens me about this, especially as I have seen further episodes, is what an asset she would have been to the team with her hunting skills. There have been many days where the remaining individuals have gone with little to no food in part due to their limited hunting skills. She was and would have continued to be a valuable contributor to the team if she would have been able to continue. My point? Age is something you can't change--everyone gets older, and it certainly beats the alternative. Many times with age comes greater knowledge and experience--knowledge and experience that would be gravely missed were it not there to benefit the group going through difficult circumstances. The other person that left that day was the other member of the team that was experienced in outdoor activities and skills. He didn't leave because of physical duress (although I'm sure there was physical duress for everyone involved)--he left because he didn't like being part of a group in this type of situation. From what I could gather, he was used to making decisions on his own, and he didn't like the group dynamic, and having to consult with/wait for/depend on/ others in a situation that he recognized was dangerous, such as when there was a slower member of the group, and he was anxious to get to shelter for survival purposes. He elected to go home because he was used to doing things by himself, and he no longer wanted to participate in the experience. Well, my thanks goes out to Discovery Channel for airing Out of the Wild The Alaska Experiment. I just went to find the website for it to link it here, so I will probably check that out some more, but the program times are there. (I don't know anyone who works for this channel, I just like what I'm learning on this program.) If they air repeats, I would recommend watching them. How would you/I/we do if we found ourselves in harsh circumstances working with a group of people who had the same goals to survive? What are our attitudes? What can we contribute towards the group's survival? Hopefully we are/are getting prepared enough so that we can supplement our diet/supplies with some meat from local wildlife, rather than depending solely on their occasional appearance to have anything to eat at all. After all, wildlife wants to survive as well. Just watching the beavers on this show was evidence of that. And in other Idaho news, from Post Falls comes this article, which contains this opening line: " A community garden will teach students about growing vegetables while helping them cultivate better lives, school officials in this north Idaho town believe." While the students won't get the immediate benefit of the food grown, (according to the article, "Food produced at the garden will be donated to area seniors who are no longer able to garden for themselves") they will be learning valuable skills--a fact that is summed up nicely in the article's last line: ""I think this is absolutely the most wonderful thing," said Barb Tilton, a local gardener. "This is so good for the kids. This is something they can take with them for the rest of their lives." Yeah, it's a plunger, but it's a plunger for washing clothes. My dad came up on Friday from out of state and brought a bunch of emergency preparedness stuff (thanks Dad!!) 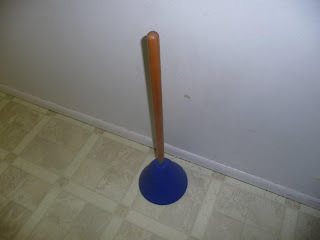 which will probably be mentioned here and elsewhere, but today the plunger gets the place of honor. I am very glad to have the plunger, and the plan at the moment is to use it in a food storage bucket when the power goes out. You could use it in a tin tub, I suppose, but seeing as how we don't currently have one of those in our possession, a food storage bucket will have to do. 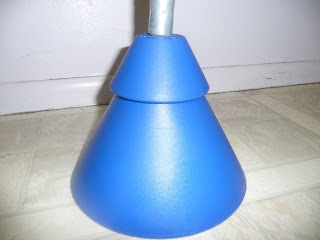 "I bought a gavanized metal version of the Laundry Plunger over Lehmans for somrthing like $12.00. I had my Better half test it and she says it works fine for small loads. I also bought a couple of metal bushel and a Half buckets to heat wash and rince water in over an open fire if required. The advantage of this thing is that it has two speeds, fast and slow, the motor draws about 300 watts, which my solar system can handle. 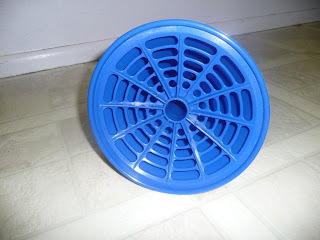 The wringer is a bit to learn to use, but I am sure the average 3rd grader can figure it out." Ok, wasn't that better in terms of just plain old wonderful and useful information? Just an example of how much you miss if you don't read the comments. And how much others miss if you don't leave yours.... Thanks to Gen, Sondra, Kymber, Jennifer, and Carl--your comments and sharing of knowledge are much appreciated! I did go and invest in some hand sanitizer the other day. I went to Wal-Mart to make said purchases, and was told that they were out except for the trial/travel/incredibly small size, so I got a few. Thing is, when I went to actually purchase everything, there were larger bottles in the check-out line, so I got one, along with the tiny ones. My point---if you go and think they are out of hand sanitizer, check the temptation shelves that stare at you as you wait in line, and make sure that they don't have some there....I personally am keeping the hand sanitizer in storage in case someone gets sick, and using good old soap and water for regular handwashing.